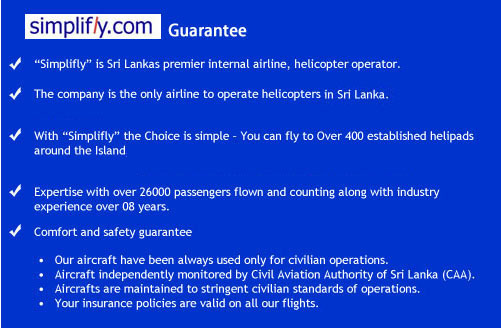 Simplifly is Sri Lanka´s leading internal airline. It is our mission to do what we do best, flying our guests in exquisite comfort and safety to any part of Sri Lanka. In operation since 2004 and with over 28,000 passengers flown (and counting), our experience and expertise is unmatched by any other domestic airline. That is why we are today the airline of choice for tour companies and leisure and business travelers who choose to fly within Sri Lanka. We remain committed to leading the industry in every way, starting with our personal meet and greet services, the youngest fleet of any internal airline, the widest range of aircraft, and rigorous internal and external audits to ensure our technical and service delivery are second-to-none. Simplifly is a backed by and is a joint venture between the Millennium Group of Singapore and Favourite Group Sri Lanka.